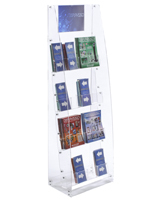 Clear acrylic pockets are durable yet won't distract customers from your literature. Adjustable brackets let you alter the height of each holder. 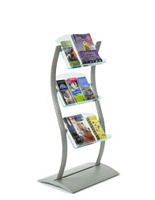 This leaflet display is an eye-catching, wave stand to help distribute informational pamphlets or brochures. 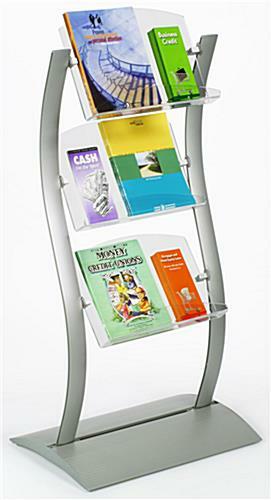 The literature holder, leaflet display features (3) pockets, constructed from clear acrylic. 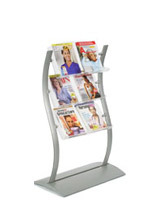 This leaflet display, also known as a promotional stand, has a unique, wave design to help draw attention to your pamphlets. 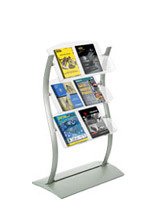 This leaflet display has (2) curved side supports to hold your literature pockets in place and to create an attention-grabbing fixture. 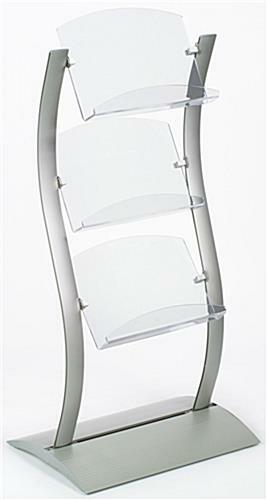 The side supports are made from aluminum and feature a smooth, silver finish for additional magnetism. The brushed aluminum is also rust-resistant when used indoors! 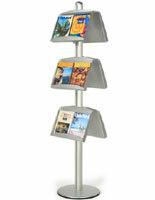 This brochure stand is an adjustable leaflet display! Use the channels along each side support to alter the height of each pocket. You can also use the brackets to adjust the angle at which each holder sits. 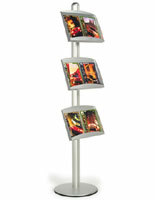 The wave fixture, leaflet display is a great addition to any office, lobby, trade show or hotel. 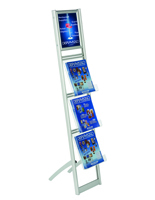 This leaflet display, such as our other wave stands, will draw customers to your presentations, helping you successfully circulate your pamphlets. 16.0" x 13.0" x 2.5"
Its scratched already from trying to put together twice. It would have been nice to know that the inserts don't sit in place unless you put the brackets up high. Had to put together twice. We're so sorry to hear you had some trouble with this stand, Christy! One of our customer care specialists will reach out to assist. Thanks so much for letting us know! Satisfied but would have been nice to have instructions. Product is great, but the only part that included instructions was the shelf holders. I still do not know what to do with two parts. Thank you for your feedback, Tracy. If you need assistance, our customer care team will be happy to help you out. They are available via phone, live chat, or email.